My rating: 8.5/10. Michael Kors MK5896 watch. Ladies chronograph PVD rose gold timepiece. Hello, today I’m doing a Michael Kors MK5896 review. This is a stunning ladies Michael Kors watch from the Parker collection. It features a PVD rose plated stainless steel casing and bracelet with pink blush centre links. The bezel features a sparkling stone set finish. I hope you enjoy this Michael Kors MK5896 review below. 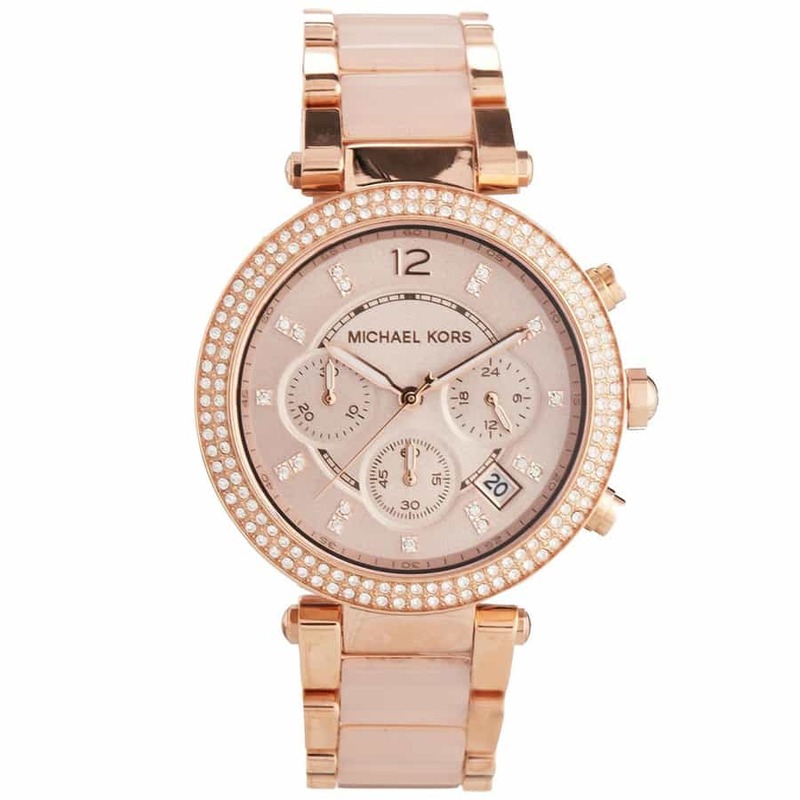 Powering this ladies Michael Kors timepiece is a Japanese quartz movement. Quartz movements are known to be reliable as well as accurate. They require very little maintenance and have a long power reserve. This is a kind of large watch when it comes to women’s sizing. The casing diameter measures 39mm and has a thickness of 12mm. I mentioned the strap earlier on but I’ll go over it again for anyone out there skim reading. The strap is made of stainless steel and has both a rose gold PVD plating and soft pink finish to it. It measures approximately 18mm width which goes with the casing size nicely. The strap fastens with a standard fold over push release button clasp. This has proved to be a popular Michael Kors watch for quite some time now. It features a really nice design with this beautiful stone set finish which as both good and bad attributes in my opinion. I was impressed with the 100m water resistance rating, not something I was expecting on this type of timepiece. Hope you enjoyed this Michael Kors MK5896 review. Find more watch reviews below.